Scanning Electron Microscopy - SEM - is a powerful technique in the examination of materials. It is used widely in metallurgy, geology, biology and medicine, to name just a few. The user can obtain high magnification images, with a good depth of field, and can also analyse individual crystals or other features. 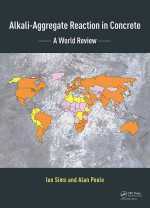 A high-resolution SEM image can show detail down to 25 Angstroms, or better. When used in conjunction with the closely-related technique of energy-dispersive X-ray microanalysis (EDX, EDS, EDAX), the composition of individual crystals or features can be determined. 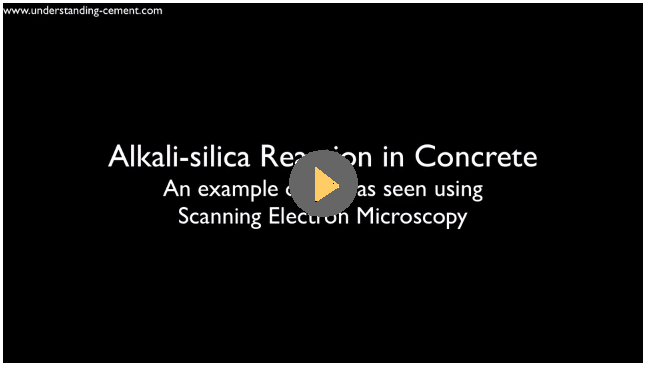 There are many different ways that scanning electron microscopy and X-ray microanalysis can aid studies of materials. 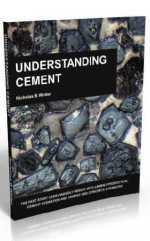 For applications relating to cement, see "Scanning Electron Microscopy of Cement and Concrete". Here on this page, we'll have a quick look at the SEM and ancillary equipment. Invented some 50 years ago, SEM is now a mature technique and is applied widely in many scientific applications. A normal scanning electron microscope operates at a high vacuum. The basic principle is that a beam of electrons is generated by a suitable source, typically a tungsten filament or a field emission gun. The electron beam is accelerated through a high voltage (e.g. : 20 kV) and pass through a system of apertures and electromagnetic lenses to produce a thin beam of electrons., then the beam scans the surface of the specimen by means of scan coils (like the spot in a cathode-ray tube "old-style" television). The microscope operator is watching the image on a screen. Imagine a spot on the screen scanning across the screen from left to right. At the end of the screen, it drops down a line and scans across again, the process being repeated down to the bottom of the screen. The key to how the scanning electron microscope works (and this is the clever bit) is that the beam scanning the specimen surface is exactly synchronised with the spot in the screen that the operator is watching. The electron detector controls the brightness of the spot on the screen - as the detector "sees" more electrons from a particular feature, the screen brightness is increased. When there are fewer electrons, the spot on the screen gets darker. These days, the screen is generally a digital monitor, not a glass crt, but the principle is the same. The magnification of the image is the ratio of the size of the screen to the size of the area scanned on the specimen. If the screen is 300 mm across and the scanned area on the specimen is 3 mm across, the magnification is x100. To go to a higher magnification, the operator scans a smaller area; if the scanned area is 0.3 mm across, the magnification is x 1000, and so on. There are different types of electron image. The two most common are the secondary electron image (sei) and the backscattered electron image (bei). 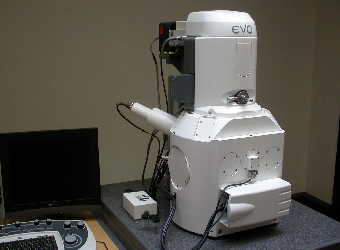 The sei is used mainly to image fracture surfaces and gives a high resolution image. The bei is used typically to image a polished section; the brightness of the bei is dependent on the atomic number of the specimen (or, for compounds, the average atomic number). 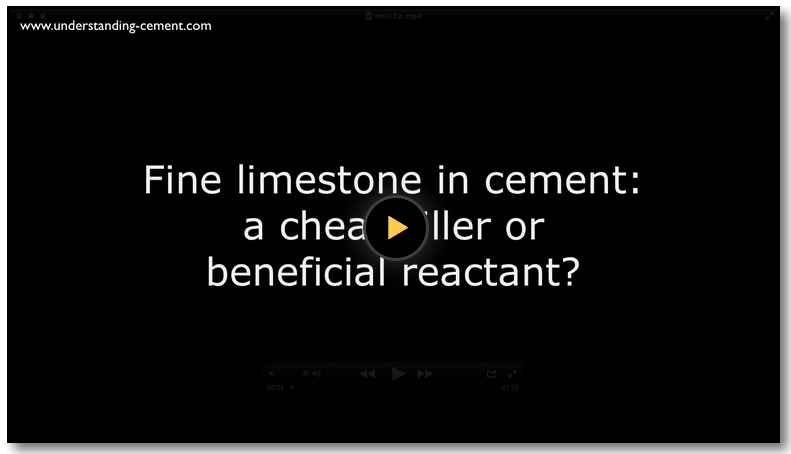 For example, lead will appear brighter than iron and calcium oxide will appear brighter than calcium carbonate. The bei is, in essence, an atomic number map of the specimen surface. All SEM images are in black-and-white, although they may subsequently have false colours applied to them for aesthetic reasons or to aid interpretation. A development of the normal high-vacuum scanning electron microscope is the ESEM, or Environmental SEM. The ESEM can operate with air in the specimen chamber - the pressure is lower than atmospheric pressure but higher that the high-vacuum of a normal SEM. This has the advantage that wet specimens can be examined without them dehydrating and is especially useful for biological specimens and other specimens containing water, such as freshly-mixed cement paste. If you are considering buying an SEM or EDX system, you obviously need to consider carefully what type of equipment you need to get. If you are not (yet) an expert, you should take advice from a specialist in your field of study. Energy-dispersive X-ray microanalysis (EDX, for brevity) is complementary to SEM. It enables the operator to determine the composition of the features in the SEM image. The principle of EDX is that the electron beam generates X-rays within the specimen. Many of these X-rays have energies characteristic of the elements that emitted them. So, if you can measure the energy of the X-rays, you know what elements are present in the specimen. If you control the instrumental conditions carefully you can determine not only what elements are present but their concentrations. There are three principal components to a basic EDX system: the X-ray detector; a box of electronics called the "pulse processor" that measures the voltage pulses corresponding to the X-ray energies, and a computer, typically a PC. The X-ray detector is positioned to intercept X-rays emitted from the specimen. On entering the detector, an X-ray generates a small current, which is then converted into a voltage pulse. The size of the voltage pulse is proportional to the energy of the X-ray. A computer measures the voltage pulses over a period of time, say 60 seconds and plots them as a histogram. The histogram shows a spectrum of the X-ray energies that were measured; by examining the spectrum, the elements present can be determined. The EDX system may also be able to take control of the SEM scanning system in order to collect elemental distribution maps ("dot maps") or elemental line profiles. 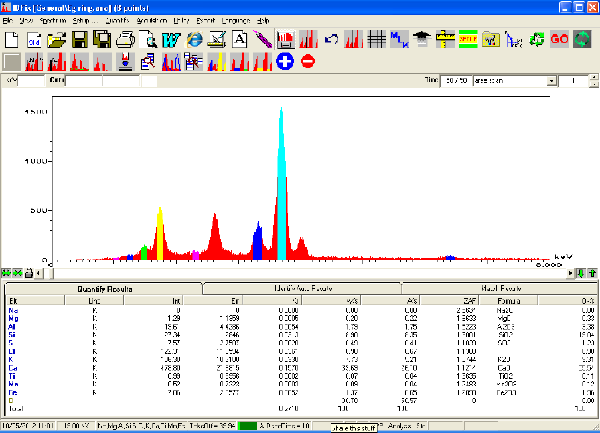 Screenshot of EDX software, showing a spectrum and quantitative analysis data. The light blue peak is due to calcium, adjacent dark blue is due to potassium, red to chlorine, yellow to silicon and green to aluminium. The EDX package used in this particular image was the SAMx IDFix. Equipment suppliers and manufacturers usually offer training courses in how to use the equipment. 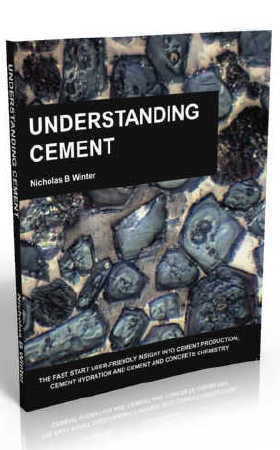 We have books and training courses specifically related to cementitious materials. 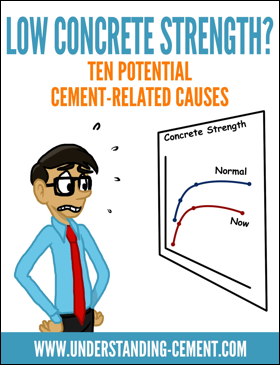 For more information see SEM training in examining cementitious materials.